Bio: Founder and Supreme Commander of Al-Qaeda. I have just awakened after a bad night's sleep. Sleeping on rocks is most painful, indeed. Now, to the Dawn prayer.. Remember, kids, true warriors of Al-Qaeda never miss the Dawn prayer. Training camp time. It is most fun. Training camps are funny, indeed. We drove over a goat with the Jeep on our way to the camp. May your soul find its way to Paradise, my lesser friend. He has been punished accordingly. 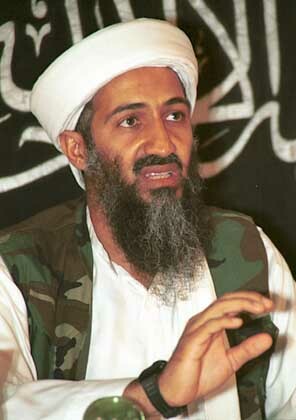 I, Osama Bin Laden, am going to teach those inexperienced mountain boys a lesson in accuracy. They can now walk with pride amongst their tribes for they have been taught how to shoot by the most humble Emir himself. PS. I hate my life. My life is surely harsh. Everyone wants to kill me, I'm hiding in a cave and I can't go to a disco or a bar without being identified. I see lots of retweets of compassion and sympathy. Thank you, my brethren. Each one of you shall get one more virgin in paradise. My cunning plan of revenge is ready.. It will kill two goats with one bullet! Time for prayer. I can't wait to see my most cunning plan in action. Blessed news have just arrived. The Infidels razed the camp to the ground and nobody survived. Rest in peace my friend, for your death will be avenged. Part 2 of my most cunning plan. We stage a ter- ... Jihadi attack against an Infidel country after we send them a threatening-toned audio-video recording full of vague bullfeces about an impeding Wrath of God. And as usual, let's give those two a good old taliban-style voting, my brethren: 1. location of the attack 2. title of the tape. If you to get #voteforterrorstrike into trending, you shall get one more virgin in Paradise. We received millions of votes, for which we are most glad. Here are the results: The "elected" location of attack is: Washington D.C. but it's where Sheikh Hussein resides, and he's one of us. So we shall attack Chicago instead. ...and the "elected" title of the tape is: "Death to Amurikan Infidels." but it is, indeed, most overused and cliché, so we shall call it "All you motherfuckers are gonna pay" instead. It is most hip. The Tape has been sent successfully. I'm on the Infidels' television! Observe my beard for it is most cute! I'm on the Interweb, too. I am surely very famous. Lets pray that my tape makes it to Billboard 200's top 40 this time. Amen. Time for prayer. Surely, I'm most pious. I shall sleep for a while. I have dreamt of my martyr dog in Paradise. Entertaining myself to the thought that my dog is enjoying his eternal life in Paradise. We have caught an unchaste woman walking in the street alone after sunset with her face shamefully exposed. We shall stone her tomorrow by noon. I'm going to pay my neighbour, Sheik Dubya Bush a visit. He invited me for dinner. I beheaded him. The filthy infidel. Time for prayer.. Thankfully, it is the last one for today. Time to play with my pet goat. Viagra is, most certainly, magic. We have just received a sample of the cocaine rolling out of our all-new production lines in Halmand. Made with pride in Afghanistan. God bless Afghanistan. Planning for jihad while high on cocaine is most cool, for the infidels will not see it coming. The plan is almost ready. I'm most surprised! In a mere thirty minutes, a hundred thousand true warriors have ascended to Paradise and a million infidels descended to Hell! This is most gladdening! Do they have helicopters in Paradise? The combination of cocaine and good news is most pleasing.. I must be in Paradise..